This is one of those books which you would want to read once, read again and keep with you to read again later. This a book which explains how we react under emotional stress. How we deal with conversational violence or silence and why we deal with it that way. 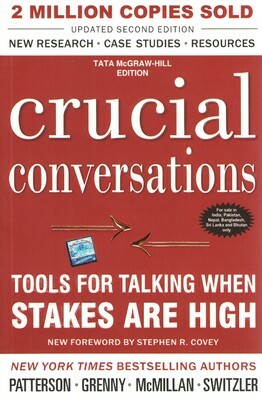 And then explains how to have these emotionally charged and difficult conversations without getting off track and make positive progress. This has had a great positive impact for me and is a must read book for folks who live with their families. Would also be extremely useful in office for those who deal with senior stakeholders and drive direction/decisions. Agree Pankaj. In one of my earlier HR assignments, I developed a sensitization kit for people managers based on this book and it worked beautifully.